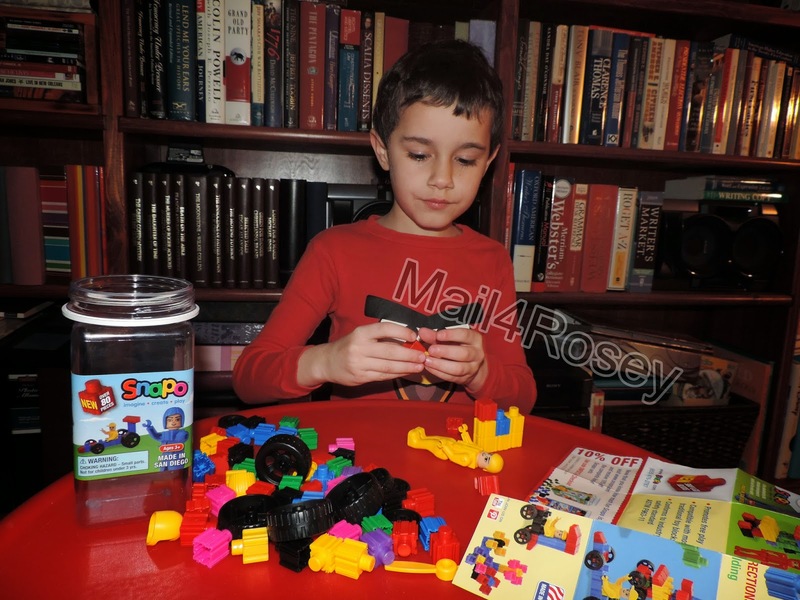 Mail4Rosey: SNAPO Click, Slide, and Rotate Your Way to Building Fun! SNAPO Click, Slide, and Rotate Your Way to Building Fun! My son likes to build things, and he's pretty great at it too. He'll start off reading the directions and make something as suggested. When that works out, the real fun begins and he'll branch out and do his own thing. Some of the concoctions he comes up with really crack me up. He's got a great imagination! 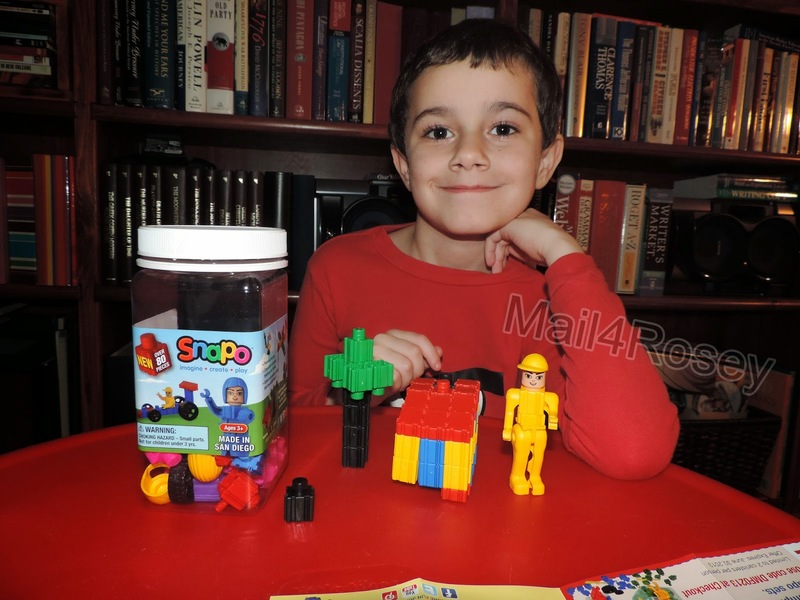 One way to encourage both (his love of building and his imagination) is through Snapo. 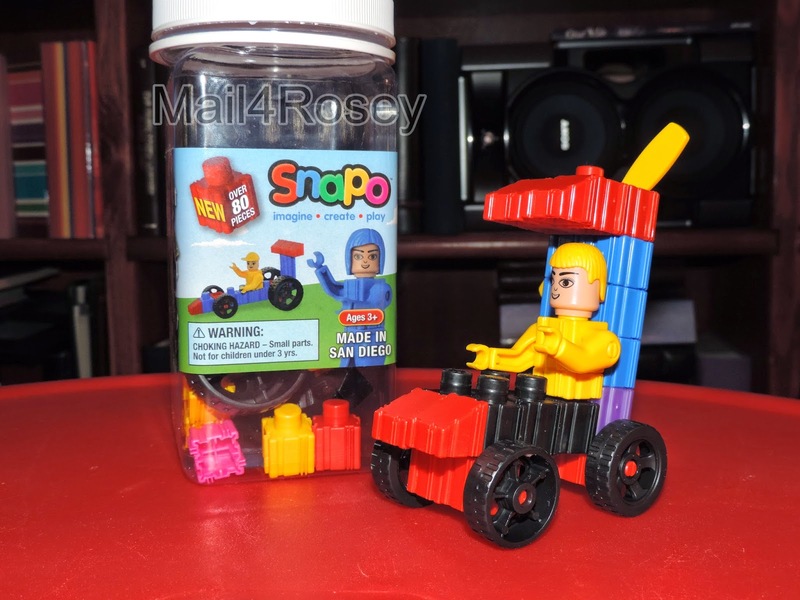 There are a lot of different brands of building blocks/kits, but for me, there a few things that really make Snapo stand out above the crowd. First and foremost, I like that they come with a storage container. This handy plastic jar makes it easy to store the pieces when they're not in use, and they help make clean-up a breeze too. It's a vertical container too, so it doesn't take up hardly any space at all. Second, I like that there are not a bazillion pieces in the kit. While huge building kits have their place, it's also nice to have a smaller container like this one, where projects can be made quickly and with ease. Third, we really like that these little pieces are so sturdy! Fourth, these pieces are easy to assemble, and they don't come off until you take them off (yet they pop off very easily when you're trying to do so intentionally). They snap, slide, and/or rotate (loving that they rotate!) at will, and honestly they're just so easy to work with....this little set has become and instant household fave. Last night after dinner and just before bed (hence the jammies ;) ) my son and I took these out to build. Above you see he made a little Palm Tree, a house, and a little guy. And then he made a little car for his guy (with a propeller on the back, in case the little guy needed to go really fast ;) ). You can learn more about SNAPO by visiting their website. You can also follow them on Facebook and/or Twitter. That looks like a great building set. I'm a big fan of blocks for kids. It's such a stimulating activity for their brains. We are big fans of them. My husband and I get in there with kiddo and build/play, too! These look like so much fun! I bet my kids would love them! My son would have loved these. I can't tell you the hours and hours he and I played with his Lego's. We had a great time. These look far more flexible than Lego's. He sure looks proud of his creations! I like how sturdy they look! Kyle would have had fun with those! He looks like he is having fun! My two love to build, so I am sure these would be a hit in my house, too. That looks like fun! I'd have to get 4 sets though, so you could build more and more things. Always fun to build and branching out and having him build his own thing sure keeps the imagination alive. This looks awesome. I know my 8 year old boy really loves building sets. Oh those video games! Gosh. Aren't they something? These sets look great! It looks like he is having lots of fun! Allison is so into building things lately. I bet she would love this. These are the kind of toys I look for. The ones that really encourage children to use their imaginations! I love all the new building sets that are coming out. So much fun for the kids! My son used to love building sets like this. I like the storage container it comes in. So convenient. well my kids LOVE legos and these are very similar to those so i'm sure my kids would love. thanks for sharing a new toy with us! This is such a cute toy. I have not seen this one before. What a cool toy to have. My son would love playing with this. Yeah some toys just have too many pieces or are too complicated. Sometimes simple toys are the best as they allow kids to maximise their creativity and imagination! I love building toys for kids, it allows their imagination to soar as well as their fine motor skills. My nephew would love these - he loves building with blocks and legos. These look like a lot of fun. Betting my nephew would love them! Thanks for sharing! My two year old would flip out over this. She is all about building things, and loves all block type toys. Such a fun looking toy. My guys love to build. These look like a lot of fun. We love building block sets. We have a whole city or two in our basement. I haven't heard of snapo before! Looks like loads of fun. We love building here so this would be great for our kiddos! So much fun! My son would love these! He loves to build thing and take them apart and start all over again! This is a really cool product. It looks like a lot of fun for kids. This looks like fun! It seems similar to legos but a little different! I'm sure my younger cousins would love to play with these! This looks like something my nephew would enjoy playing with. I think my daughter would have a blast building with these too! 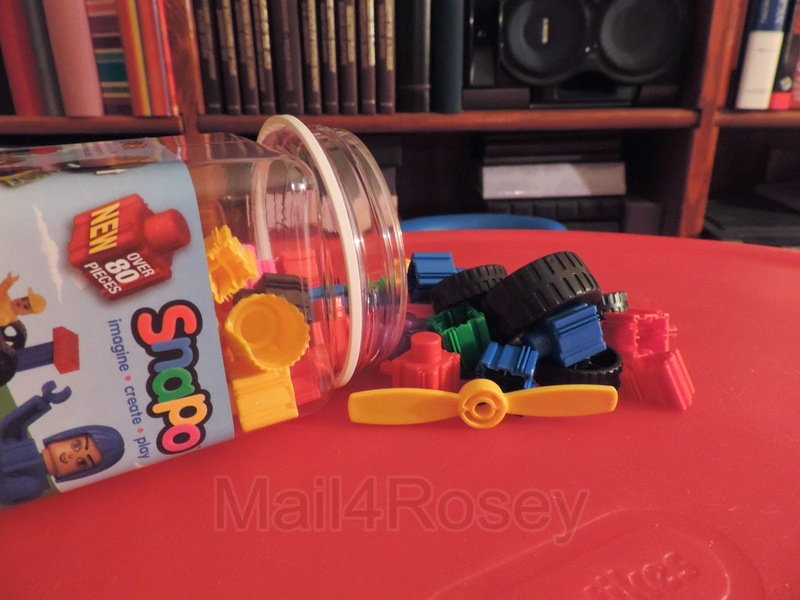 I'm not familiar with Snapo, but all 3 of my kids loved building with blocks and these look top quality. Those are great. I bet my boys would love these, they love building with blocks! Those are awesome! My son would have been all over them when he was younger. My kids prefer building kits that allow them to use their imaginations rather than a set plan. They would get a kick out of these. I love finding toys like this. They are educational and fun for everyone!! I've been looking for ideas like this .... my son loves to build, too, and these look GREAT! Thanks! I love toys that allow kids to be creative. My girls are still on the young side, but they already love their magnetic tiles and legos. I imagine this would be a hit in the future as well. I'm glad it says three PLUS... I definitely fall into the plus range. My kids would love this. I"ll have to check into getting them this. My kids would love this, they are really big on there block sets, great way to get them to be creative and also learn. Are you serious????? I have five sons and I've gone this long without hearing of snapo???? Where in the heck have I been? I have got to get these for Matt and Katie! Oh wow! Like large versions of lego! But they look big enough so that a 4 year old can easily get into them. Cool! I’m sure my nephews would love these too. It looks like he enjoyed it much! I never heard of Snap but they look fun to play with. I am sure kids would go wild with their creativity playing with these! I have never heard of Snapos before but they would be perfect for my great nephew and my nephews. These kind of toys are great for kids because they play with them for hours. Thanks for sharing. A great way to build! My son has been nuts for these kinds of sets lately! I have never seen these before, but they look amazing! With Minecraft being all the rage, I'm sure my boys would LOVE these. Those definitely look like they would be a hit with my s/o's boys. They love building with legos. My son loves those kind of toys. He loves to build and recreate and that's why he loves LEGO too. Oh, building toys are the #1 thing in our house right now, and I hadn't seen these! Thanks for sharing! These look cute. My four year old would love to play with them! So fun! My son would love playing with this. My sons would love this.Looks like a lot of fun. This is awesome! It seems like Legos are everywhere but these take it a step further. My husband would enjoy this just as much as my little guy! My son loves LEGOS... I'll have to check into these SNAPOS. I'm sure it'll be something he'll enjoy too. My daughter loves tinker toys such as this and I love getting them for her. These look like a blast! My kiddos would love them! My teenage daughter will love this kit. She loves to build. I love when they follow the first instructions and then just branch out on their own. Such fun! My son is 13 years old and he still loves building sets. He really likes the bigger pieces also because it makes the models larger with few pieces. Thanks for the review. My son would love these. He's such a little builder/architect/engineer kid. He totally gets it from his Dad! I have never seen anything like these before and my son and daughter would love them. Perfect for fingers that are not quite ready for the intricacy of legos. I love building toys like these because they allow kids to be creative. They also promote pretend play. I have never met a child who did not enjoy building toys. These look like great fun. Another great way to be creative and work on fine motor skills. All my kids love building things. I bet they would love something like these. I will have to visit their website. Wow, now that is pretty amazing! My kids would love these toys! You may have a future engineer on your hands! Snap looks like a fantastic product and he looks like he loves playing with it. Oh wow - looks really fun to work on and enhances creativity too. What a great learning too. My kids love anything that evolves building so I'm going to have to check these out. It sounds like it is so fun. I know my boys would go crazy if they had this. I really like that the pieces aren't so small. That makes it so much easier for little hands to snap them together. This looks like a fun set!!! My daughter loves building so she would love something like this! I love anything that encourages building with my kids. This looks like a really fun set. This looks really neat! I like that the pieces aren't teeny tiny. My kids have had several sets where the pieces were so small, they were hard for their little hands. These really look great to use those fertile imaginations and build up worlds never before imagined!! I knew a few boys back when who are now all grown up who would have loved this--and had they been around back then--I would have bought it for them!! He did really good with those SNAPO blocks. I like that their big and easy to put together for kids.